Many years ago I had a student whose father was a doctor. He would come along to parents' evenings in his sombre suits that he clearly wore to work, but you could pick him out from the crowd as soon as he sat down as he was partial to alarmingly bright socks, usually in vivid yellows or reds. I've done a little research on Ravelry and found that red is far from the most popular colour for socks. Perhaps it's the look-at-me quality that this dad was going for that some knitters shy away from. I would not presume to know, but here are four pairs that caught my eye. These just look good. The variegation of the Drachenwolle yarn doesn't detract from, or disguise the cabling. Instead it adds depth to the design. The pattern name is In the family circle in English and these fine examples were made by prolific sock knitter Alexandra (duesselhexe on Ravelry). In looking through thousands of sock projects, I've seen this pattern many times and these, from knitter and designer knittymelissa are good examples. I'm a relative newcomer to colourwork, but like the simplicity of the idea here of the gradual change in colour which works well. It would be a shame to wear shoes with these since the instep colourwork would be hidden from view. Stephanie van der Linden's designs seem to really stand out from the crowd and could easily have chosen two or three for this post alone. The leafy lace pattern on these Esther socks, made by knittyliciousuk, is accentuated by the hint of sparkle in the Easyknits Twinkle yarn. 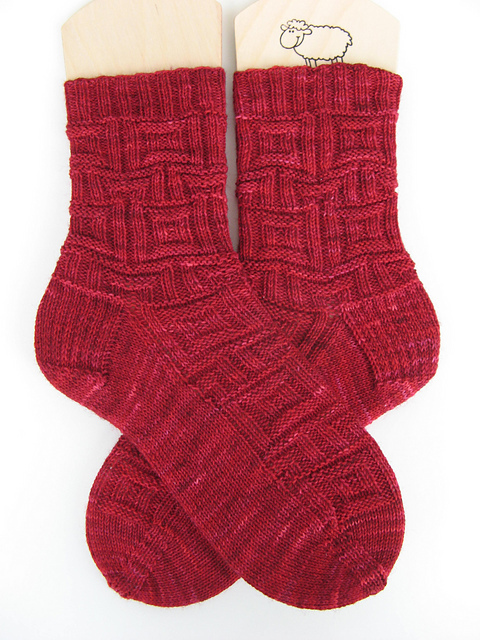 Alfrick socks are top down fraternal socks featuring stranded colourwork motifs on the leg and toes. The heel flap uses a knit/purl textured pattern that works into a slip stitch pattern to provide extra reinforcement. The textured pattern cleverly leads into the colourwork for the toes. Alfrick socks are ready to buy from the Coop Knits Ravelry store. Or you could make use of the offer in the Coop Knits shop and get a free pattern when you buy 2 skeins of yarn.